The New York Rangers have re-signed Dylan McIlrath to a one-year contract worth $800,000 for the 2016-17 season, per General Fanager. The former 10th overall selection in the 2010 NHL Entry Draft was set to have an arbitration hearing on July 21, but he and the Rangers were able to come to terms before that became necessary. 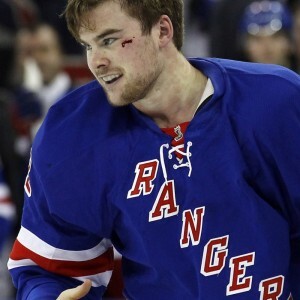 Since being drafted by the Rangers, McIlrath has only played in 37 games with the club. With some space on the Rangers’ blueline, it looks like McIlrath might finally get a chance to earn his stake as a permanent NHL player this year. At 6 foot 5 and 221 pounds, McIlrath certainly has the size to be a physically imposing defenseman in the league, although his level of play is not up to par with what New York expected when they took him so high in the draft. Previously expected to be a legitimate top-pairing, shutdown defenseman, it looks more likely that McIlrath will occupy a bottom-pairing role for most of his career. He is still only 24, however, and defensemen typically take longer to develop than most positions. There is still a chance, given more time and experience, that McIlrath can develop into a top-4 player, but it might be difficult given his style of play relative to the direction the NHL is heading with smaller, more mobile defenders. With McIlrath signed, the Rangers will now shift their attention to Chris Kreider and Kevin Hayes. Both are set for their own arbitration hearings on July 22 and July 27 respectively.